Ever dream of becoming a superhero? Want to fight side-by-side with the likes of Spider-man, Wolverine and Captain America? Then Marvel Heroes 2016 is the game for you. This thrilling action RPG is now available to stream on NVIDIA SHIELD with a GeForce NOW membership ($7.99/month with the first month free). Marvel Heroes 2016 is also the first online multiplayer game on GeForce NOW. The game lets you assume the mantle of iconic Marvel characters and embark on an epic journey. Here are seven tips that’ll ensure you enter the battlefield fully equipped and prepared to dispense justice from the get-go. Marvel Heroes 2016 boasts a huge roster of heroes and villains to play as. Best of all, you can freely swap between them in the early going. This is not only fun, but gives you a taste of the different play styles that are available to you. Starlord, for instance, is a nimble ranged attacker who uses blasters and can call in airstrikes for added firepower. The Hulk, on the other hand, is a beefy tank who thrives in close quarters along the front line. Take advantage of the game’s early moments to try out different characters until you find one that fits your style. 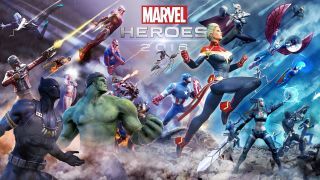 Because it’s such a popular game, Marvel Heroes 2016 has a thriving community of active players. The GeForce NOW service gives you full access to the game’s multiplayer, so open the in-game chat window and say hello to your fellow players. You’ll likely find multiple players talking to each other. They’ll share tips, offer bits of advice, and talk about their own experiences with the game. If you have a question or need some guidance, don’t be afraid to ask for help. Just be polite and show your gratitude when someone offers their expertise. It’s a great way to get ahead in the game and make some friends in the process. You’ll also gain lots of experience as you play, which gives you ample opportunities to upgrade your character’s skill set. But rather than accrue powers, put some thought into your progression. Certain abilities will fit your play style better than others, so focus on those, especially in the early going when you’re gaining levels quickly. Rather than becoming a jack-of-all-trades who’s just okay at everything, it may behoove you to max out a small set of skills first then start to branch out from there. Marvel Heroes 2016 is a complex and intricately designed game, but its interface and control scheme is intuitive on a keyboard and mouse. However, if you really want to get comfortable, consider using the NVIDIA SHIELD Controller. The ergonomic design makes long sessions enjoyable and the button layout makes it extremely easy to pull off all of your supermoves. Your enemies won’t know what hit them. The other impressive aspect of Marvel Heroes 2016 is the sheer number of quests that you can tackle. You can embark on the main story driven mission, take on side quests, and jump into timed events that will pop up in the game world. It’s easy to get overwhelmed and sidetracked, so try to stay on task at all times. Yes, it’s fun and worthwhile to put your main mission on hold, but don’t get too distracted. Thankfully, the game has a handy quest tracker and a map that can help you navigate your way around. As you defeat foes and tackle missions, you’ll accrue a wealth of items in your inventory. This can range from useful buffs, weapons, armor, crafting items and various rewards. It can be easy to get caught up in saving the world, but don’t forget to periodically clean out your inventory. Redeem your rewards, make sure you’re using the best armor and weapons available, and either sell or donate unwanted items to ensure you have plenty of space to pick up more loot. Keep an orderly inventory and you can also avoid the awkwardness of shuffling items around in the middle of an enemy infested battle zone. If you own an NVIDIA SHIELD, there’s really no reason to wait on experiencing one of the best games set in the expansive Marvel universe. Leveraging the power of NVIDIA’s cloud servers, GeForce NOW allows you to instantly stream all of the superhero action in Marvel Heroes 2016 directly to your SHIELD device with stunning detail.